The artwork aims to show how a variety of materials that would otherwise be thrown away can be recycled. 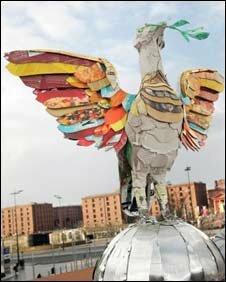 Recycling rates in Liverpool have seen an improvement over the last five years, rising from 15,000 tonnes to 49,000 tonnes, council figures show. The bird sculpture is on show at the information centre in the Liverpool One shopping complex. Councillor Berni Turner said: "We have seen a massive increase in Liverpool's recycling rates over the last few years and the amount of waste we send to landfill is reducing. "Nearly everyone is recycling at least one material which is great news, but we don't want to rest on our laurels and we're encouraging residents to recycle as much as possible." Once collected and sorted waste textiles can be used to create mattresses, glass bottles can be turned into sand for golf courses and just one unwanted toaster can create 25 steel cans. Due to the nature of the material, glass can be recycled indefinitely and a recycled newspaper can be back on the shelf in seven days. Laura Underwood, from the group Recycle Now, added: "The amount of waste we send to landfill is constantly falling but if everyone recycled the full range of materials routinely collected in our areas, like plastic bottles, metals or textiles, we could really improve upon this.